Dear Fam! It’s about time to analyze one of the very first exercises that is fundamental to master in order to approach chin-ups and pull-ups on the bar or on rings.Let’s see of which exercise we are talking about more in depth! Why do you keep trying to perform pull-ups on a high bar, if you are barely able to do one rep?! Stated that, I don’t wanna be too much critical, but this is what I come across most of the times, while watching random videos on YouTube. 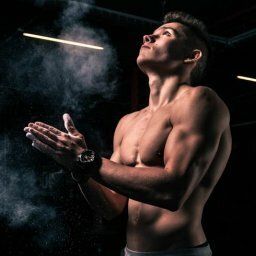 Videos of guys showing how they improved and changed over a year or more, with many more efforts than needed, just because since the beginning of their Calisthenics journey they totally ignored the possibility to start approaching pull-ups from an easier way of execution. You should look for a waist-high bar first thing first!!! Australian chin-ups and pull-ups are the fundamental elements on which is based the strength needed to be able to perform, later on, chin-ups and pull-ups on a high bar. In order to perform them you must indeed look for a waist-high bar or, in case you don’t have one, you can also consider of course buying a pair of rings, hang and regulate them in the same way so to have a waist height. As for all the other exercises we have seen until now, also in this case a rings’ approach is a must in order to master them correctly. Both versions imply to have a horizontal position of the body compared to the vertical one you would have if hanging on a high bar. Just to facilitate the approach to the pulling movement, you can touch the ground with your feet and in this case starting from an even easier position of the legs as well, which are going to be bent and later on straightened so to make the exercise a little harder. So, also here, you have a beginner version and an intermediate-advanced one. Let’s start of course from the beginner one! As you noticed, I’m always placing the supinated grip first, since I wanna make sure that you all understand the importance of not having gaps while developing the conditioning that allows you to perform the harder exercises along your journey. If you never had a chance to train with bodyweight exercises and you are a complete neophyte, you might want to start from an easier position of execution that is not completely horizontal to the ground with your body, but oblique. In this way, you won’t be completely on your feet (standing position), but at the same time not even completely horizontal, so to help a little the pulling movement and start to understand how the motor pattern works while keeping your core and glutes tight. If you start instead from the second level of difficulty, you are in a horizontal position already, but with legs initially bent. The third and last level is again horizontal, but here legs are straight making the execution a little bit more intense. Of course, the last two levels above can be performed on a waist-high bar, if you can find one, otherwise rings can be always a valid substitute. If you think about it and you try to figure out how the movement looks like, well there’s not that much difference if not for the fact that with rings you still have a slightly wider ROM. As we anticipated above, this exercise (in its final form) wants you to start from a horizontal position of your body while keeping of course always that hollow position, hence squeeze your core and glutes to keep the form and avoid unbalances. Either you perform this exercise on a waist-high bar or higher, arms are placed at a shoulder-width, hands in a supinated position with thumbs always in, scapulae slightly retracted and shoulders depressed. Once you found the level suitable for you (legs bent or straight, high bar or waist-high), make sure to perform every repetition aiming to touch with your chest the bar or, in case you’re using rings, to bring back your elbows as much as you can at every repetition. In case you are able to perform already australian pull-ups with a pronated grip, make sure to let the elbows follow the natural line of your hips whenever you perform a repetition having legs either bent or straight. To end up with, I’d like to open a small parenthesis regarding the grip variation you can include if you are going to perform australian pull-ups on rings. The fact is that, as we explained also for the archer pull-ups, with rings you can vary the grip while executing the exercise. Neutral grip: in this case, the exercise identifies as the better known ring rows, since you start by grabbing both rings with a neutral grip indeed (no false grip needed) and at every repetition remains the same for both concentric and eccentric phase. Pronated to neutral grip: this variation implies to start with a pronated grip, hence rings are horizontal from your point of view and only when you pull (concentric phase) you will rotate the grip into a neutral one so to get both elbows as close as possible to your hips or even behind. Of course, whenever you come back (eccentric phase) the grip switches again from the neutral to the pronated one. This slight variation is just to train forearms and arms to a different motor pattern that wouldn’t be achievable on the bar. Of course, in this little article, we wanted to emphasize the importance of building strength and conditioning by mastering these very first types of pulling exercises that, as you noticed, can be approached on different levels of difficulty, hence of execution. Don’t forget that, once you become strong enough with these first variations, you can aim to change your goals and direct them towards mastering all the other grips, pull-ups and chin-ups can be performed indeed also with close, wide, mid and inverted ones. Thank u so much for the support and the appreciation! Stay tuned for more exciting and useful contents from us! We do really care about providing the best information ever in order to help people around the world to get the best out of their bodies and characters!